The most important political event at the beginning of this year in Serbia was the official visit by President of Russia Vladimir Putin and the Serbian authorities’ muscle flexing, designed to show the EU, Kosovo and the opposition that Moscow loves Serbia. The Serbian authorities plan to use this situation to win the upcoming elections this spring and also to strengthen their position in relations with the EU and the United States. Vladimir Putin is, clearly, the most charismatic modern leader and also the most popular politician in Serbia. This is demonstrated by the comments made by the Serbian public and media the day after the Russian president’s visit, which can therefore be regarded as having tipped the balance in favor of Russia’s standing in the Balkans. Putin clearly put forth Russia’s firm position on Kosovo, saying that the only basis for the settlement of the conflict is stipulated in UN Security Council Resolution 1244, under which Serbian troops and police should be deployed in some parts of Kosovo and Metohija. This can be interpreted as Russia’s support for the division of Kosovo in Metohija but only if this does not run contrary to Resolution 1244. Russia and Serbia have signed over 20 interstate agreements and other documents, which will strengthen their economic ties. The possible acquisition of Russian weapons and equipment will strengthen the Serbian army and create additional tension in the region, as will the extension of TurkStream via Serbia. Both sides have clearly indicated their interest in this sphere. President of Serbia Aleksandar Vucic said they would prefer Russian gas to run via Bulgaria rather than Ukraine, which would balance the gas interests of Germany and Serbia. Of course, the final decision on the pipeline’s route rests with the EU, but possible opposition on this matter would provoke the wrath of Hungary and Slovakia, which are getting ready to pump Russian gas into their storage facilities. This would make Bulgaria yet another disgruntled EU member, which will be catastrophic for the liberal forces in the European Parliament ahead of the elections. It is significant that Vucic has confirmed Serbia’s neutral policy, while Chairman of Bosnia and Herzegovina Presidency Milorad Dodik said that Bosnia and Herzegovina would do its best to avoid joining NATO. Taken together, these statements by Vucic and Dodik could create a major obstacle to Serbia’s European integration. Although the EU is Serbia’s largest donor and the country has been identified as a potential candidate for EU membership, Putin’s visit can be interpreted as a message from Serbia that the EU cannot consider the matter of its expansion in the Balkans as closed, and possibly that its expansion is over. This is definitely Serbia’s response to Brussels’ lack of resolve on imposing sanctions on Kosovo over its 100 percent tariffs on imports from Serbia, which costs Belgrade 40 million euros a month. The EU is fighting its own demons, including European populists Salvini and Orban, the upcoming May elections and Brexit, but it is also trying to preserve its position as the only force capable of settling problems in its neighborhood. The actions it has taken so far have come to nothing, whereas Kosovo has clearly shown that the United States is the only power that can influence its policy. 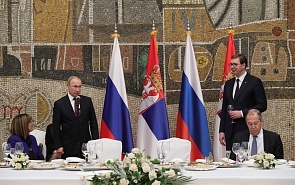 Serbia continues to emphasize that strategically it is looking towards the EU, but Putin’s visit could cast a shadow on this statement, because Vucic’s attitude to Putin has been more in accord with Serbia being a region of Russia than a potential EU member. The numerous opponents of EU expansion will see this as proof that Serbia is “a small Russia” in the Balkans, and that Serbia’s admission to the EU could create a Russian alliance within the EU, which is inadmissible. What they fear most is that the United States and Russia can exclude the EU from the game and ultimately settle the Kosovo problem between them. The Russian president has made it plain that this was a visit to the Serbian people and that Russia will continue to closely monitor the developments in the Balkans, pursue a clear and balanced foreign policy and do its best not to undermine its fragile relations with the EU, especially in light of its energy plans for the region. This will make Russia one of the main players in the future settlement of the Balkans problem. Every visit has a symbolic message. President Putin was given a Sarplaninac, a fearless dog from the Sar Mountains which is not afraid of any other animal, not even a bear. The Russian president, for his part, inserted the missing fragments into the mosaic in the Church of Saint Sava, symbolically completing the mural. ﻿The strategic goal of Russia’s policy in the Balkans is preserving positions in its own civilizational area, which has historically included the South Slavic space. The tactical ones include creating a comfortable environment for Russian companies (primarily from the energy sphere) and counterbalancing NATO’s influence in the region. In the long run, the tactical goal could be a full-scale inclusion or even initiating a multilateral solution of the “Balkan issue” by organizing an international conference.